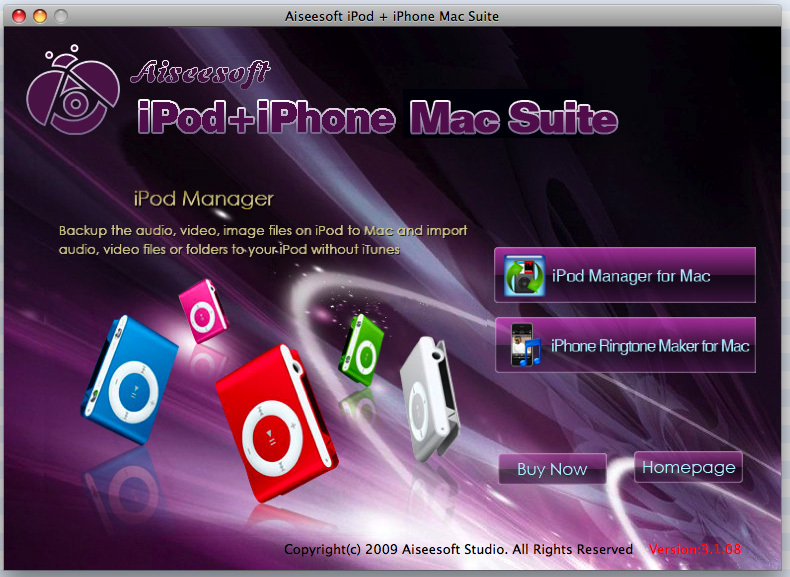 Aiseesoft iPod + iPhone Mac Suite is equipped with two useful iPod iPhone software, Aiseesoft iPod Manager for Mac and Mac iPhone Ringtone Creator software. Naturally, it allows you to transfer iPod/iPhone files to Mac, import files or folder on Mac to iPod/iPhone directly, transfer files between iPods. And the newly-upgraded iPod Manager for Mac also can support iPod touch 4, iPhone 4, iPad and iOS 4 after upgraded. ...... almost all the video and audio formats like AVI, MPEG, WMV, MP4, FLV, MKV, H.264/MPEG-4, DivX, XviD, MOV, RM, RMVB, MP3, WMA, AAC to iPhone ringtone M4R. Then you can upload directly to your iPhone as the ringtone, you also can edit the added iPhone ringtones. It is easy to backup iPod videos/audios to Mac directly by using this iPod Manager for Mac in this iPod + iPhone PC Mac Suite. You can get any time length from the video/audio source by using Mac iPhone Ringtone in this iPod + iPhone Mac Suite software. With the help of iPod Manager for Mac in iPod + iPhone Mac Suite software, you can import your files or folder from Mac to iPod. Qweas is providing links to Aiseesoft iPod and iPhone Mac Suite 3.1.36 as a courtesy, and makes no representations regarding Aiseesoft iPod and iPhone Mac Suite or any other applications or any information related thereto. Any questions, complaints or claims regarding this application Aiseesoft iPod and iPhone Mac Suite 3.1.36 must be directed to the appropriate software vendor. You may click the publisher link of Aiseesoft iPod and iPhone Mac Suite on the top of this page to get more details about the vendor.